Football Jumpers .com » Blog Archive » Football Jumpers at the Races ? Football Jumpers at the Races ? The Melbourne Cup, has been run and won , and its all over bar the shouting . Traditionally , the Cup, attracts the more unusual attire, amongst punters and racegoers . The Members area , Sponsors Marquees , and Fashions on the Field, promote stylish , conservative race day apparel. Some attendees , wishing to have fun , often dress outrageously , or in a themed mode of dress . With many racegoers , being Collingwood supporters , it begs the question , " Was the traditional black and white of race day , adopted by fans , wearing football jumpers ?" Increasingly, the humble football jumper , jersey , guernsey , has made a foray into social events , why not the Races ? 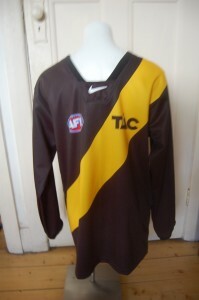 Was a Retro Richmond Jumper worn to the Races ? This entry was posted on Tuesday, November 2nd, 2010 at 3:55 pm	and is filed under AFL, football jumpers, NRL. You can follow any responses to this entry through the RSS 2.0 feed. Both comments and pings are currently closed.